Cancers of the upper aerodigestive tract (UADT; including oral cavity, pharynx, larynx and oesophagus) have high incidence rates all over the world, and they are especially frequent in some parts of Latin America. However, the data on the role of the major risk factors in these areas are still limited. We have evaluated the role of alcohol and tobacco consumption, based on 2,252 upper aerodigestive squamous-cell carcinoma cases and 1,707 controls from seven centres in Brazil, Argentina, and Cuba. 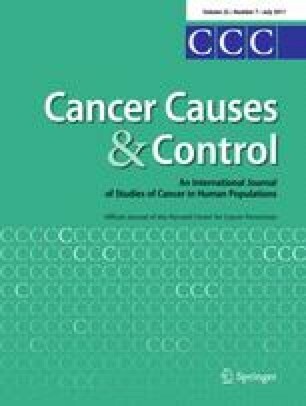 We show that alcohol drinkers have a risk of UADT cancers that is up to five times higher than that of never-drinkers. A very strong effect of aperitifs and spirits as compared to other alcohol types was observed, with the ORs reaching 12.76 (CI 5.37–30.32) for oesophagus. Tobacco smokers were up to six times more likely to develop aerodigestive cancers than never-smokers, with the ORs reaching 11.14 (7.72–16.08) among current smokers for hypopharynx and larynx cancer. There was a trend for a decrease in risk after quitting alcohol drinking or tobacco smoking for all sites. The interactive effect of alcohol and tobacco was more than multiplicative. In this study, 65% of all UADT cases were attributable to a combined effect of alcohol and tobacco use. In this largest study on UADT cancer in Latin America, we have shown for the first time that a prevailing majority of UADT cancer cases is due to a combined effect of alcohol and tobacco use and could be prevented by quitting the use of either of these two agents. The study was funded by the European Commission INCO-DC programme (grant no IC18-CT97-0222), with additional funding from Fondo para la Investigacion Cientifica y Tecnologica (Argentina) and Fundação de Amparo à Pesquisa no Estado de São Paulo (grant no 01/01768-2). Katarzyna Szymańska undertook the work reported in this paper during the tenure of a Postdoctoral Fellowship awarded by the International Agency for Research on Cancer. The authors thank Valerie Gaborieau from IARC for technical help and Mathieu Boniol from IARC (now at IPRI, France) for valuable statistical advice.